After an international exhibition in Philadelphia in 1876, Grand Rapids, Michigan, became recognized as a world leader in the production of fine furniture. 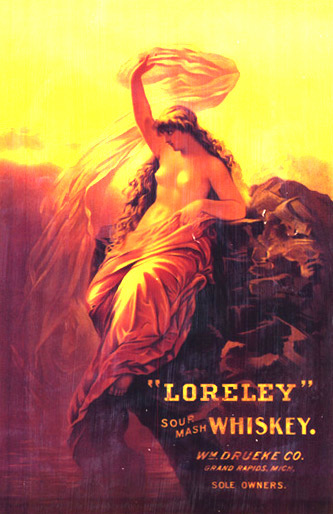 Three years earlier, a young German immigrant had arrived in that city and began building a future for himself and eventually his family by becoming a leader in purveying good whiskey. His name was William Peter Drueke, shown here in retirement. Drueke was born in 1853 in the town of Niederheld, 58 miles east of Cologne. At the age of 18, he left from the port of Hamburg on the steamship Thuringia, arriving in New York City. He was accompanied by his sister and her future husband and her husband’s children. Drueke is believed to have stayed with them in New York for two years before moving to Grand Rapids. In the 1875 city directory, he was listed as a clerk for William Hake, a wholesale wine and liquor dealer on the east side of the Grand River that runs through the city. Drueke proved to be an able employee and by 1876 had become a traveling agent for the Hake firm. With continuing advancement, William Peter, age 29, found it possible to get married, His bride was Elizabeth Berles, 24, who worked as a milliner and was the daughter of a Grand Rapids grocer. The couple exchanged vows in November 1882 at St. Mary’s Church, a parish formed in 1857 to serve the city’s German Catholic immigrant population. They would go on to have eight children. 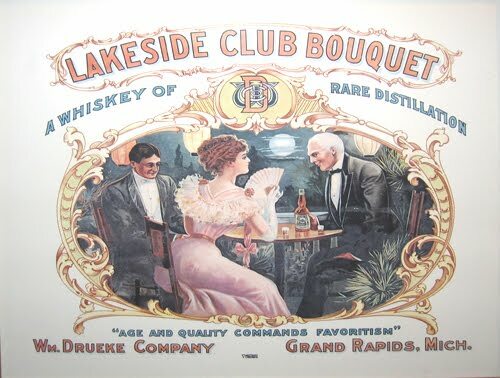 In 1883, after working for Hake for seven years, Drueke started his own wholesale liquor business, partnering with a man named Alexander Kennedy. 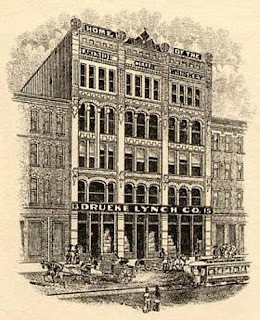 Their firm was located at 25 Canal Street (now Monroe Avenue) on the east side of the Grand River. After a year the Kennedy & Drueke firm moved to 75 N. Waterloo Street, still on the east side. Apparently the working relationship between the German and the Irishman was not an altogether smooth one. In 1888 it was announced that Drueke and Kennedy had dissolved their partnership of five years. William Peter took the stock and fixtures and relocated at 16-18 Crescent Avenue where he continued business, as shown by his letterhead, under the name William Drueke Wholesale Liquor Merchant. Kennedy stayed at the old address. 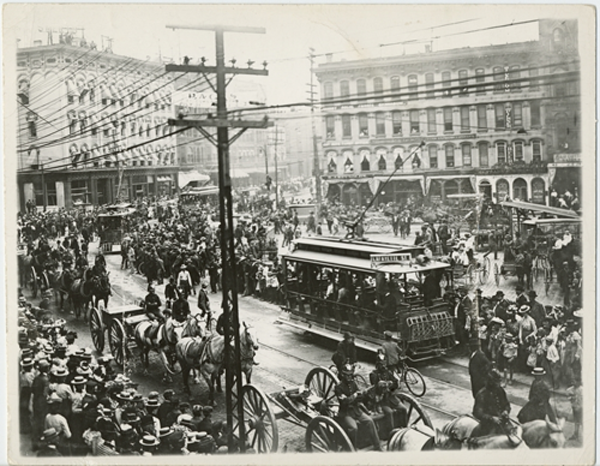 The 1890s were a period of growth for Grand Rapids as its furniture business thrived and population grew, as exemplified in a 1898 photo. It also was a time of expansion for Drueke’s firm and in 1897 he moved it several blocks south to Ionia Avenue. The business name was changed to Wm. 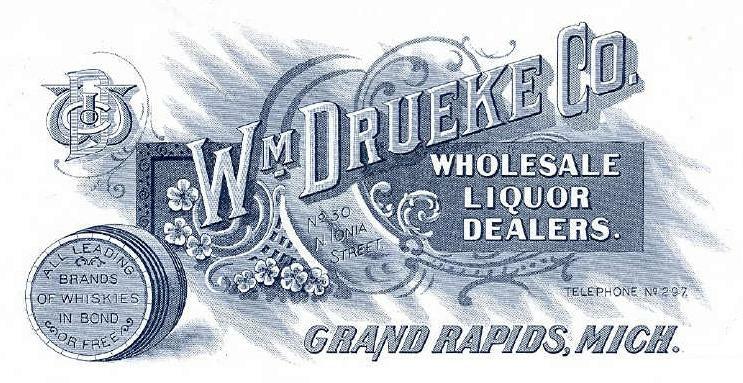 Drueke Company, with William Peter listed as President. His wife’s cousin, Frank Berles, formerly the bookkeeper, was named Secretary and Treasurer of the corporation. A new letterhead marked the change. The firm used the brand names "Lakeside Club", "Lakeside Club Bouquet", "Loreley", and "Old Cargo, with Lakeside Club Bouquet being the flagship brand. 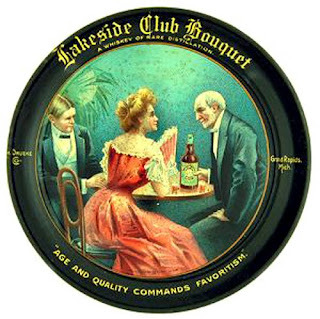 Drueke merchandised all of his whiskeys with attractive giveaways to saloons and other favored customers. As shown here, they included signs, posters, and tips trays. 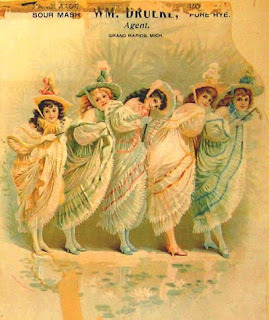 William Peter liked to advertise featuring comely women, some demure as in the five young ladies shown here, some more provokative as in the Loreley sign. 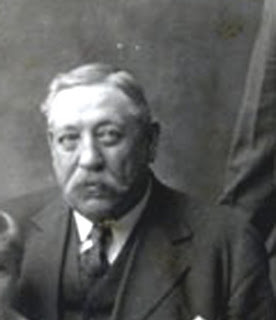 In 1907, at age 54 perhaps for health reasons, William Peter stepped down as president of the firm that bore his name. Henry Huber replaced him and Drueke became Vice President. Frank Berles was replaced as Secretary/Treasurer. In 1908, William Peter's son William Francis left his father's liquor business to become a traveling salesman for a wholesale grocery. Eventually, this son would start the Wm. F. Drueke & Co., a manufacturer of chess sets, backgammon, cribbage, and other games. Based on the Grand Rapids directory listings, Wm. 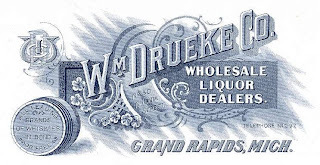 Drueke Company went out of the retail business in 1910, but remained in wholesale liquor. A year later, the organization faced another major management change. 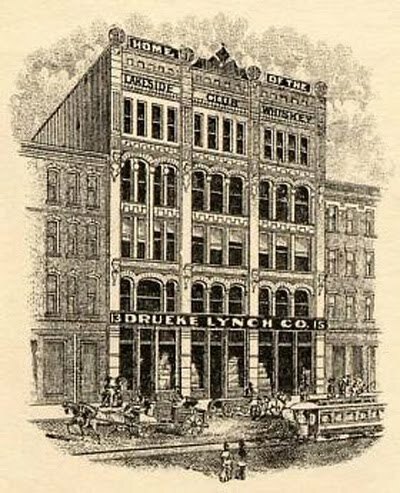 The name of William Peter's company was changed to the Drueke-Lynch Co. Henry Huber was out as president, but Drueke remained Vice President. The new president was C. H. Kahler. The business was moved a block south to S. 13-15 Ionia Avenue in a structure known as the Blodgett Block. The building, shown here in an illustration, is still standing. In 1912, Grand Rapids directories list William Peter as “traveling agent” for the company he founded rather than Vice President. In 1913, he was restored to Vice President with another new set of company officers. C.H. Kahler was out as president and management was shaken up once again. This change too would be short lived. Michigan was one of the first Midwest States to vote in statewide Prohibition, two years before it became national law. On April 30, 1918, Drueke-Lynch was forced out of business. William Peter was then 65 years old. 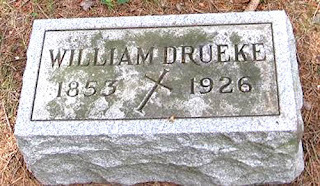 In April 1926, after eight years of retirement, Drueke died of cancer at the age of 73. He was survived by his wife Elizabeth and six of their eight children. He was buried at Mount Calvary Cemetery in Grand Rapids. His obituary in the Herald noted that he had been in the liquor trade for 43 years, that he had traveled to all parts of Michigan while involved in that industry and that he was well known throughout the state. It did not comment on why so many major management shake-ups had occurred to Drueke’s business over the years. Note: Unlike most of my whiskey men vignettes in this blog, this one has been researched and illustrated almost entirely from a single source. It is a website sponsored by Peter Biggins called the “William Peter and Elizabeth Berles Drueke Family.” The site gives considerably more information than is provided here about the personal life of Mr. and Mrs. Drueke and their children. It is one of the better researched family geneological efforts that I have seen. The Groves: "By Their Fruits Shall Ye Know Them"